If anyone is interested in the weeWX adapted version of the weather34 template, you can find it at the link below courtesy of Ian Steeple. All support questions on this adapted version should be directed to Ian and not to Brian at weather34. Here is my web site (https://weather.sathy.us) using this template. 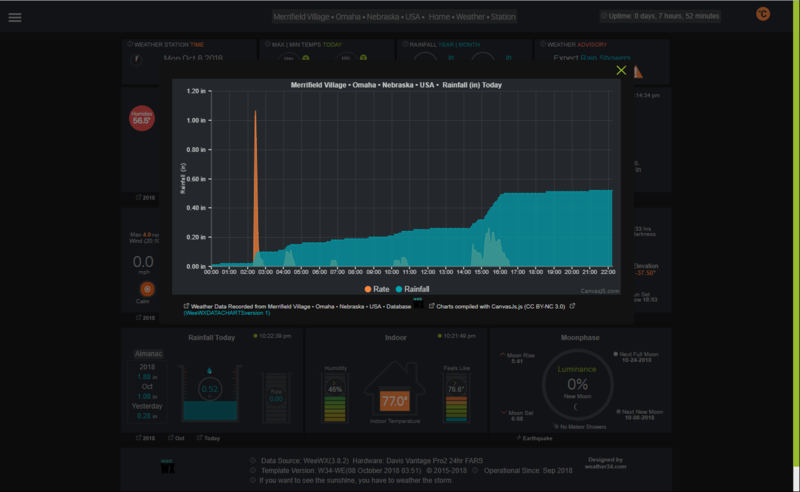 The additional benefit of this adapted template is the capability to display CanvasJS charts generated from native weeWX historical reports rather than a feed from the free Weather Underground API , which as many of you know is going away shortly. I think that we can all agree that the real strengths of weeWX are what goes on 'under the hood (or the bonnet for a Brit like me)', its sheer adaptability and a huge community working out solutions together. I came to weeWX after years of being a Cumulus user (another excellent software) but came to a grinding halt when changing to unsupported Weather Station. It was weeWX to the rescue along with the HP1000 driver and I was back up and running. In my Cumulus days I had been an early adopter of the excellent weather34 template, designed and owned by Brian Underdown. 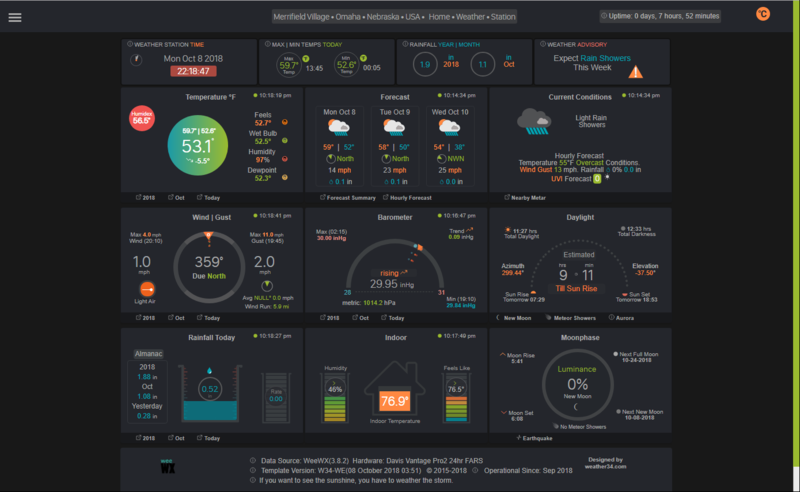 This was originally designed for use with Cumulus as a single dashboard concept where everything is accessible from a single web page. So could I use the template with weeWX, yes by deploying the CRT extension to generate a realtime.txt file. Now I wanted it to do more, I am not a coder so it takes me a bit longer to discover the snippets of code that I need to make things happen and this is where this forum and others became a valuable resource for myself along with contributions and technical support from others. A big thanks here to David Marshall who has rescued me on more than one occasion. The latest version is now using the weeWX archive database to generate the pop-up CanvasJS charts instead of relying on Weather Underground. The setup guides are provided for general guidance only due to the multitude of ways weeWX can be setup by individual users. I would like to re-iterate that although Brian Underdown is very happy for this version to exist and be maintained, he offers no support whatsoever for this version. Any requests to do so will remain unanswered. Please respect Brian's wishes in this respect. Any issues should be directed to this forum. When used with a smartphone or a narrow browser window, the page morphs into a slimline mobile version. At the link below is a general guide on integrating weeWX weather software with the weather34 web template adapted for weeWX by Ian Steeple. In this example, the weeWX server and the web server are on separate systems. Download the guide to use the embedded web links. I'm trying to install the template (WE34-WE131018), but get the following error. When installing Apache and PHP, did you follow the guide referenced in Step 2 of my writeup. Not sure if the reason is this but you may have not installed some PHP modules such as "php-curl" and "php-mbstring" . Are your weeWX and webserver on the same computer or is the server at a remote location. Also what is the root of your webserver. If it is different to /html you will need to edit the skin.conf file. Yes I did follow your write up. I believe I have everything required installed...Will check this evening. They are on the same computer. Will check the ownership of the webserver this evening. The root of the webserver is "var/www/html". The ownership is pi:www-data and permissions are 0775. Going to reread the instructions taylormia provided. Might of skipped something. The path match in both the Weewx config file and the settings1.php file. The real time txt file does update. Everything is working fine on mine except the daylight box. Is there a specific setting I missed for that? Looks like you are missing the "version.php" file in /var/www/html. Step 4d in my guide describes how this file is generated. I don't have nor know weeWX but presume the 192.168.2.10 in your http://192.168.2.10/pws/chartswu/monthlytemperature.php is an IP address in your local network and not visible from outside. Not sure where you would set that though in the weeWX version. I have W34-WX and 34-WE installed. Your realtiem.txt has no data. But where does the problem come from? The extension does create the file, but the scrubbed data is wrong. I am posting this in case it is an issue. I use installed weather34 template for weeWX on my raspberry pi. I did all the setup changes to get weewx charts working in the template but only todaybarometer.php was working. In looking at the url in the different php files I noticed on the charts that do not work there is ..// or ../ in front of weewx directory which is different than the todaybarometer.php. Removing the extra level change allowed all the charts to work. I followed all the latest install guides I could find but do not know why the url paths to the csv files have the extra level changes. PS The template is a really nice, so I hope this posting will help someone. Also, I managed to figure out the issue with the charts not showing due to the " ../ " misprint, but only after some frustration. Wish I had seen your posts earlier. Funny how just one chart worked, the barometric pressure, as if it were a test or a puzzle meant to be solved! Gotta love it, right! Page created in 0.099 seconds with 50 queries.